What’s in a word? Anything you want there to be! D for daring, E for enchanting, L for loving, I for inspiring, C for captivating, I for intriguing, O for outgoing, U for unique, S for sophisticated: DELICIOUS. Twenty-five exhilarating real-life stories about delicious women, eccentric men and stubborn dogs. This book is meant to entertain you. It will make you laugh until there are tears in your eyes. It will become your faithful companion, and will help you find yourself. It was written for you because you’re delicious the most delicious girl in the world. Tales for Delicious Girls offers witty, refreshing, clever and ironic insight into relationships between men and women from all points of view. The book is a modern relationship manual, providing answers to the most pressing dating and friendship questions that strong, independent, modern women want to know. Tales for Delicious Girls deals with wishes, desires and dreams as well as hilarious mishaps and dating disasters. However, Tales for Delicious Girls is not simply a humorous book. In addition to entertaining the readers, the tales will inspire women to think about their own life and relationships, see themselves through different eyes and realize that they are their own best friend, the pillar of their own life, and the only person they can always count on. â€œTales for Delicious Girlsâ€ encourages women to love, respect and appreciate themselves, to live the life they have always wanted, and become aware of their true uniqueness and deliciousness. Tales for Delicious Girls contains over fifty beautiful, original illustrations by Nela Vadlejchova. 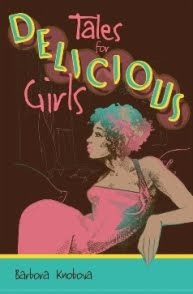 According to author Barbora Knobova, a “Delicious Girl” is daring, enchanting, loving, inspiring, captivating, intriguing, outgoing, unique, and sophisticated. In her book Tales for Delicious Girls, Knobova compiles twenty-five stories from her life and the lives of her friends (all Delicious Girls) and weaves them into funny memoirs with poignant messages on life, relationships, and girl power. Whether you read Tales for Delicious Girls in one sitting, like I did, or savor the stories in little snack-like bites for a pick me up (like I intended to! ), you’ll be left feeling great about yourself and reminiscing about the times you proved to yourself that you are a Delicious Girl! I received Tales for Delicious Girls from the publisher for review, and the above opinions are my own. No other compensation, other than a few laughs, was received. Barbora Knobova is a writer, relationship coach and expert in Delicious Life. A world traveler, she is one of those rare world citizens who live everywhere and nowhere. Barbora is a firm believer in female friendship, loyalty and bonding. She writes hilarious, sharp-witted, caustically apt, ironic, moving, true books for strong, independent, smart, fearless women. Barbora has also written several self-improvement books and teaches women about the importance of self-love in relationships and life in general. Barbora speaks eight languages and has found her home away from home in New York, London and Milan. She is always on the move, accompanied by her beagle Brinkley, the nasty dog fromTales for Delicious Girls. You can visit her website at www.barboraknobova.com.